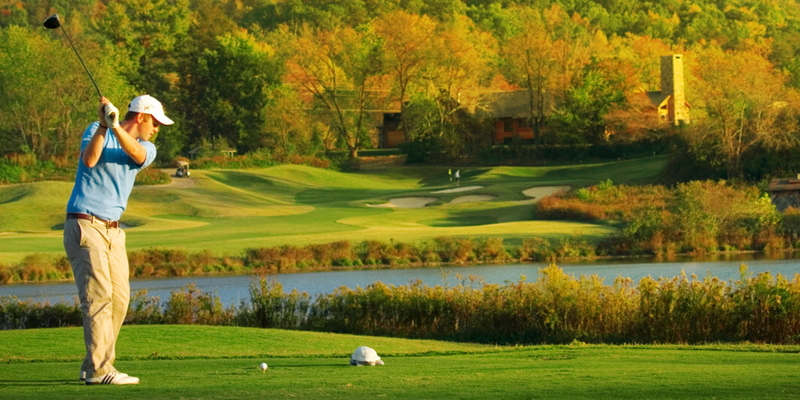 The Brasstown Valley Golf Course has been ranked by both Golf Digest and Leading Golf Courses of America as one of the top courses to play in Georgia. Designed by Denis Griffiths, the golf course winds through wildlife preserves, ponds and streams framed in by the mountains. With five sets of tees, all skill levels will be able to enjoy a layout that is maintained to standards you'd expect. It's great for the corporate outing, couple's getaway or the guy's weekend. The facility also offers full practice facilities, well equipped Pro Shop and customized special tournaments. Golf lessons and clinics are also available through Director of Golf, Steve Phelps, PGA Professional. The award winning course is managed and maintained by the resort staff, so the guest's experience is the first priority. Great golf is the goal. The golf course is open year 'round. Golf rates include cart & range balls. Rates vary seasonally, so please call us at 706-379-4613 for tee times and current rates. Director of Golf, Steve Phelps, PGA offers individual, group lessons or clinics. To book on for inquiries, call 706-379-4613 or email him at steve.phelps@brasstownvalley.com. Lodging is available on property either in our ain lodge or in cabins on site. Golf pacakages are available for individuals or groups. For more information, go online at brasstownvalley.com or call us at 706-379-9900. We offer breakfast, lunch and dinner in our main dining room. We also offer "pub-fare" in Brassies, our sports bar/19th hole, which is open for lunch, dinner and beverages. Yes, a full service spa is located on property. This is for the individual guest, wedding parties or groups. This profile was last updated on 07/31/2018 and has been viewed 8,140 times.